This is the third in a series of seven articles that will catalogue an important group of drawings by John Ruskin at King’s College, Cambridge. For general notes on the collection see under article #1. 3. 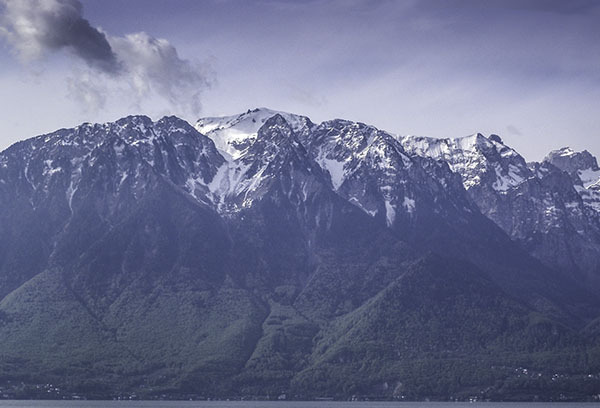 The Dent d’Oche range on the south side of Lac Leman from Vevey, Switzerland, 1846? The Dent d’Oche range on the south side of Lac Leman from Vevey, Switzerland, 1846? Photograph: David Hill, courtesy of the Master of King’s College, Cambridge. Connoisseur, August 1969, as Lake of Geneva, 1855?, repr. Exh. Abbot Hall 1969 no.45 as ‘Geneva, lakes’, lent by Guy Barton. 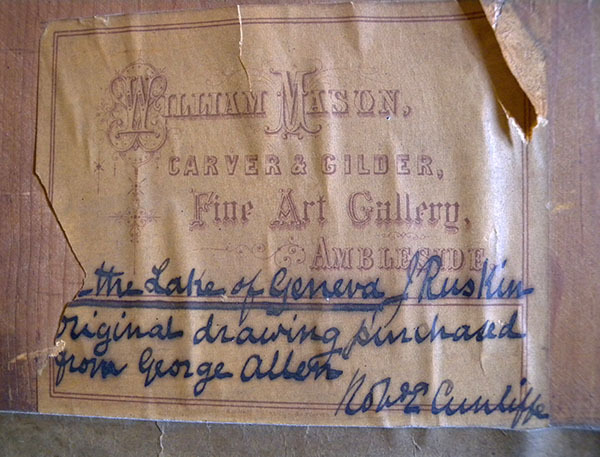 Ruskin Newsletter, no.25, Autumn 1981, p.11 as no.2 as ‘Geneva, lakes, 9 3/4 x 20 3/4 ins’. Hitherto described as ‘On the Lake of Geneva’ or ‘Geneva, Lakes’, this watercolour can here be identified as recording the view across the eastern end of Lac Leman (commonly called Lake Geneva) from the south-facing wine-growing town and resort of Vevey. In it Ruskin meticulously traces the the Dent d’Oche range as seen in early morning light whilst the sun rakes across the north-facing gullies and ridges, rendering them in optimal, but fleeting, relief. Such an effect lasts only about an hour while the sun passes through the east at about 7 am, and the observation is so painstaking that it seems certain that Ruskin must have worked on this drawing on successive mornings. From left to right, the main summits are those of Le Grammont (2172m), followed by (left of centre) the isolated peaks of the Cornets de Bises (2432m), then, almost dead centre, come the lower summits of the Plan du Pre, followed by the Roc du Chateau d’Oche (2199m) and finally the Dent d’Oche (2222m). The French town of St Gingolph lies on the shore more or less directly below the Plan du Pre, but is not indicated since presumably obscured by mist over the lake. Comparison with a photograph taken from the promenade at Vevey, proves how extraordinarily accurate Ruskin’s observation was. Never before, we may be sure, had this scene been drawn with such effort to understand the mountain forms so particularly. Detail of peaks from Le Grammont to the Cornets des Bises. Peaks from Le Grammont to the Cornets des Bises. During the mid-1840s notions of truth became Ruskin’s core artistic and aesthetic preoccupation. He wholly committed himself to this in 1845 and during subsequent years consistently elaborated its practice. One strand (see Ruskin Drawings at King’s College, Cambridge, #2) concentrated on form in architecture, resulting in Seven Lamps of Architecture published in 1849, and Stones of Venice published in 1851-53. The other strand concentrated on form in nature and landscape, particularly mountains. The Alps were Ruskin’s principal obsession in the early 1840s, and particularly the Mont Blanc massif. He would certainly have been well aware that the mountains to the left of this prospect rose in 70 km of successive waves towards the summit of Mont Blanc. 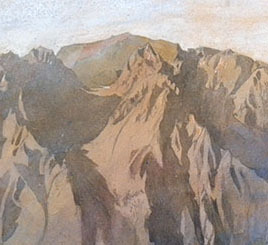 For ten years between 1846 to the publication of the fourth volume of Modern Painters in 1856 the high Alps provided the ground on which he built his philosophy of geological understanding, and for ten years afterwards saw them as so vital to his being that he thought of setting up home amongst them. The King’s College Ruskins include two of the early masterworks of that labour and two of the last (to be treated as Ruskin Drawings at King’s College, Cambridge, #4, #5, #7) and another the product of him actually implementing his plan to live amongst the mountains (Ruskin Drawings at King’s College, Cambridge, #6). The drawing can securely be dated to the mid-1840s on stylistic grounds. It has a much greater sense of volumetric form than drawings before 1845 and rather less graphic confidence than drawings after 1846. In 1845 Ruskin visited Vevey only as a stage on his journey home from Venice. He was tired, suffering from a cold, travelling with all haste, and it seems impossible that this can have been made on that occasion. In 1846 however he made a stay of several days in early to mid-August. He was working much more at his leisure, accompanied by his parents, and enjoying all the pleasures of the resort: We can confidently ascribe the drawing to this visit. The visit of 1846 was his fourth. He visited with his parents during their first two continental tours of 1833 and 1835. On the first occasion they were recrossing the Alps after exploring Italy and as a prelude to further exploration of Switzerland at Lausanne, Fribourg, Bern and Interlaken. 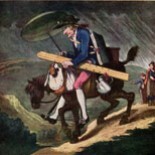 In 1835 they arrived on 24 July following a crossing of the St Bernard to Aosta and Courmayeur. They stayed four days and then moved on to Yverdun through Lausanne. Ruskin recorded in his diary that it was very warm and he extolled the view of lake and mountains observing a red haze above the water. Later in the same tour they looped back through Vevey on 8 Sept, but on that occasion it was wet. Ruskin’s early visits to the Alps opened his eyes only to the hills. To his youthful impatience the resorts such as Vevey seemed fit abode only for the Devil and his tribe; a place of luxury and indolence, designed to divert him from his higher destiny. In Poetry of Architecture, 1837-8 he described the north shore of Lake Geneva ‘as monotonous a piece of vine country as any in Europe, studded with villas’ (Works 1/160) In a letter of 1843 (note 1) he prescribed a tour of the Alps for the painter George Richmond but was very offhand about Vevey, saying that Richmond could go there if he liked, but that the south shore at St Gingolph was far superior. In 1844 he travelled to the Alps with his parents who made themselves comfortable at Vevey whilst Ruskin went on an independent tour to Chamonix to grapple with the environs of Mont Blanc. They met up again at Geneva and there is no evidence of him visiting Vevey at all in that year. In 1845, although he only passed through Vevey returning home, he had begun to mellow to the pleasures of such places, and to be able to relax and find valuable work in the environs. There was indeed much to enjoy and in which to luxuriate. In 1842 the Hotel des Trois Couronnes was rebuilt as a neo-classical palace on the lake shore and (by all accounts) remains, with a neo-baroque makeover in 1890, one of the most palatial hotels in Europe. The Trois Couronnes was Ruskin’s regular resort at Vevey. The King’s watercolour was probably made from one of its lakefront rooms. I have already told how fond my father was of staying at the Trois Couronnes of Vevay,when I was up among the aiguilles of Chamouni. In later years, I acknowledged his better taste, and would contentedly stay with him at Vevay, as long as he liked,—myself always perfectly happy in the fields and on the hillsides round the Château Blonay. Also, my father and mother were quite able at any time to get up as far as Blonay themselves; and usually walked so far with me when I was intent on the higher hills,— waiting, they, and our old servant, Lucy Tovey,1 (whom we took abroad with us sometimes that she might see the places we were always talking of,) until I had done my bit of drawing or hammering, and we all went down together, through the vineyards, to four o’clock dinner; then the evening was left free for me to study the Dent d’Oche and chains of crag declining southwards to Geneva, by sunset. Thus Vevay, year after year, became the most domestic of all our foreign homes. At Venice, my mother always thought the gondola would upset; at Chamouni, my father, that I should fall into the Mer de Glace; at Pisa, he would ask me, “What shall I give the coachman?” and at Florence, dispute the delightfulness of Cimabue. But at Vevay, we were all of a mind. My father was professionally at home in the vineyards,—sentimentally in the Bosquet de Julie; my mother liked apple orchards and narcissus meads as much as I did; and for me, there was the Dent du Midi, for eternal snow, in the distance; the Rochers de Naye, for climbing, accessibly near; Chillon for history and poetry; and the lake, in the whole breadth of it from Lausanne to Meillerie, for Turnerian mist effects of morning, and Turnerian sunsets at evening; and moonlights,—as if the moon were one radiant glacier of frozen gold. Then if one wanted to go to Geneva for anything, there were little steamers,—no mortal would believe, now, how little; one used to be afraid an extra basket of apples would be too much for them, when the pier was full of market people. They called at all the places along the north shore, mostly for country folks; and often their little cabins were quite empty. English people thought the lake of Geneva too dull, if they had ever more than an hour of it (note 2). My photograph of Ruskin’s view was taken from the promenade in front of the Trois Couronnes. It seems highly likely that the present watercolour was actually made from Ruskin’s room in the hotel. Long walk over the hills between here and the Dent de Jaman [i.e Mont Cubly, towards Les Avants], remarkable for abundant springs and stoneless pasture with splendid pines; the latter on the higher hills distorted and thrown into grand excrescences of trunk, six or eight feet over, with two or three trees growing out of them. Out of one, with many of its branches in full foliage, grew also a large mountain ash, eight or ten feet from the ground where it started from the pine trunk; another smaller shoot below. As I was drinking at a fountain in descending, a peasant standing by said gracefully and solemnly, ‘Qui-conque boira de cette eau-ci aura encore soif, mais celui qui bora de ‘l eau que je lui donnerai, n’aura jamais soif’ (note3). The passage is isolated between previous entries at Florence on 7 June, and Chamonix on 23 August. Greater detail may be furnished by a diary of the tour kept by John Thomas Hobbs (‘George’), Ruskin’s valet, at the Morgan Library (MA 2539). The diary comprises p.1-166 of a 256 p volume and covers the dates 2 April to 5 October 1846, presumably in some detail. This looks like a potentially useful source, but little has ever been published. There are a few dated drawings of subjects from this visit. The first is a study of pines dated 10 August at the Ruskin Library, University of Lancaster, evidently taken on the walk mentioned in the diary (note 4). Another drawing at the Ruskin library is dated 12 August and records the nearby Chateau de Blonay (note 5). My drawings are truth to the very letter—too literal, perhaps; so says my father, so says not the Daguerreotype, for it beats me grievously. I have allied myself with it; sith it may no better be… It is certainly the most marvellous invention of the century… As regards art, I wish it had never been discovered, it will make the eye too fastidious to accept mere handling (Works 3/210). On 13 August he made a now untraced drawing of the Dent d’Oche range from above Vevey (note 6), possibly similar to the drawing presently under discussion, and on 15 August he made and dated a drawing of the of Dent d’Oche range from Les Pleiades above Vevey now at the Ruskin Library, University of Lancaster. This makes interesting comparison with the present drawing, for it shows almost exactly the same mountains but from a much higher viewpoint, and from further east. Shows the same mountains as the King’s drawing, but from a rather higher viewpoint, and a couple of kilometres further left. The present drawing represents a more prolonged consideration, but it is possible to gain a real sense of the three-dimensional forms of the hills in the comparison. This was a fundamental part of Ruskin’s practice. He felt that such knowledge of the form was essential to drawing it correctly. He had already quartered the compass around Mont Blanc from near and far, and in his letter to George Richmond of 1843 he contrived to introduce the mountain to his friend from a variety of vantage points so as to build up such a knowledge in his mind (note 7). He ruminated over this for a number of years and implemented it in his thorough examination of the Matterhorn in 1849, which informed a detailed discussion of the problem in the fourth volume of Modern Painters published in 1856, and allowed him to that no-one before him, including level-headed geologists had understood the particularity of mountain form sufficiently to see it correctly (note 8). The reference to the daguerreotype in the letter indicates that he was developing the interest in the medium that he started in Venice in 1845 (see Ruskin Drawings at King’s College, Cambridge, #2). The letter indicates that he had collected further examples of architectural subjects in Italy, and tantalises us that he might have bought examples taken at Vevey, but if so none appear to have survived to this day. Nevertheless it is clear that he was thinking about the potential redundancy of his extended labour in work such as this. At this early stage in his considerations, he wondered at the effortlessness with which the photographic process could record visual appearances. For him to attempt the same required exhausting attention and conceptual effort, and still in some respects fell short. In the comparison between these two drawings, however, we may see that his drawing was an apparatus for perceptual engagement. As his commentary on photography developed he came to realise the superiority of drawing as a mental practice, and to understand ‘mere handling’ as the articulation of perceptual depth (note 9). 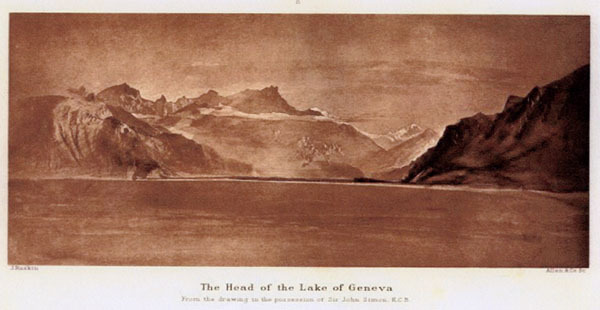 Ruskin furthered his study of the scenery at the head of the lake with another large drawing. This was owned by Sir John Simon, an eminent Doctor of Medicine Sir John Simon, and close friend of Ruskin from the 1850s. It was reproduced in sepia in the Library Edition of Ruskin’s works, Vol.5 pl.E, with the note that it was then in America, but is currently untraced. Reproduced here from The Library Edition of the Works of John Ruskin, 1903-13, Volume 5, plate E.
Effectively continuing the field of view of the King’s drawing to the left. This must have been taken from a boat in the middle of the lake, since the Dents du Midi are hidden behind the hills to the right. Ruskin was a strong rower, and took to the water at every opportunity. The head of Lac Leman from Vevey. Photograph: David Hill, April 2011. Showing how prominent are the Dents du Midi from the promenade at Vevey. This records a rather grand sweep of the Head of Lac Leman, and effectively continues the field of view of the present drawing to the right. It is of particular interest is that is taken from the Lake itself. We can be sure of that for the Dents du Midi, which dominate the view of the head of Lac Leman as seen from the shore at Vevey, are hidden behind the slopes to the right. This only occurs when considerably more than a mile off shore. Ruskin was a strong oarsman, and enjoyed being out on the water, and such a distance would have been well within his capabilities. It is intriguing that Ruskin chose to work up this specific view rather than that from the shore. After all, in the view from the shore the Dents du Midi cut an especially dramatic profile for a subject. In those respects Ruskin’s subject in the Simon drawing was decidedly inferior. He presumably expected that any informed viewer would recognise the particularity of his position, and realise that Ruskin’s storyline was at least as much about the view point as the view. Floating in this vast basin between the mountains, surrendered and sundered to the sublime. Ruskin returned to Vevey on numerous occasions in later years, and made several fine studies there, besides composing a number of very fine pieces of writing in the rooms of the Trois Couronnes. Two pictures are worth detailing here as being directly related. The first is a drawing at the Rijksmuseum, Amsterdam (1987-19) called ‘Head of Lake Geneva’. This is an extraordinarily intense and graphically fluent study of the mountains sloping down to the southern shore of Lac Leman as seen from Vevey, and most likely from Ruskin’s rooms in the Trois Couronnes. These slopes are effectively the continuation to the left of the field of view of the present drawing, or the same slopes as seen at the far right of the Sir John Simon drawing. 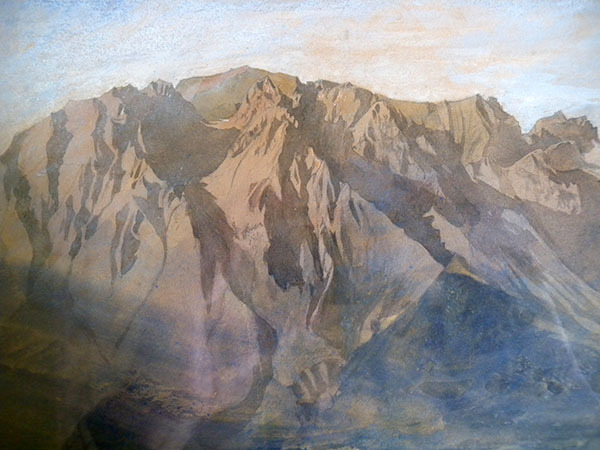 When exhibited at the Royal Academy exhibition of The Great Age of British Watercolours in 1993 (no.246, repr. In catalogue as pl.164) the Rijksmuseum drawing was dated c.1846, but this seems too early. In style it sits much better with an extended series of studies made at Chamonix, Zermatt and around the Head of Lac Leman in 1849.
dates it to 1846 and says: ‘Although there is no firm identification of the subject, it is likely that this watercolour depicts a view of Lake Geneva looking out from the town of Vevey, located at the northern end of the lake. A faint inscription at the bottom of the paper reads ‘Vevey May 2[? ]th’ suggesting that this identification is the correct one.’ The subject is in fact exactly the same view of the mountains on the south shore of Lac Leman as the Rijksmueum study albeit under misty conditions. The inscription dates it to 1849 by the fact that this was the only occasion on which he was at Vevey during the last ten days of May. It is beyond the scope of the current article to make any more extended study of Ruskin’s associations with Vevey but it would certainly be worth dwelling on (and indeed in) Vevay at some length. As Ruskin would have said, DV that may come to pass. Thanks to Professor Stephen Wildman, director of the Ruskin Library, University of Lancaster, for permission to reproduce and Jen Shepherd, administrator for swift supply of, The Dent d’Oche range from Les Pleiades above Vevey (RF1081), above. 1 See David Hill, ‘Perfection I should call it: A personal Guide to the Alps by John Ruskin’, an annotated and illustrated edition of a major early letter by John Ruskin to George Richmond – in British Art Journal, 13/1, Summer 2012, pp.54-67. 2 Reminiscence of narcissus meads at Vevey in Praeterita, Works 35/168 and of father at Vevey in Works 35/517-8: Mentions writing this passage in a letter to C.E.Norton of 24 June 1886, Works 37/567. 3 The Diary entries here are generally quoted from Evans and Whitehouse (eds), The Diaries of John Ruskin, 3 vols. Oxford University Press, 1956. The original diaries relating to 1846 are at the Ruskin Library, University of Lancaster, Ms3, Ms5c, and Ms7. 4 Study of Pines at Vevey, 1846, Pencil, ink and ink wash, 6 ½ x 9 ½ ins, 165 x 240 mm, Lancaster, Ruskin Library, University of Lancaster, RF 1672. 5 Chateau de Blonay, above Vevey, Switzerland, 1846, Pencil and watercolour on buff paper, 6 1/4 X 8 ½ ins, 159 x 216 mm, Lancaster, Ruskin Library, University of Lancaster RF 876. 6 The untraced drawing of 13 August may be adduced from an inscription on the drawing of 15 August at the Ruskin Library. That sheet is inscribed at the top right ‘Vevey August 13’ but that date obviously relates to a drawing that was formerly on the same sheet, but separated at some point, leaving its date behind. Below that inscription is another that records the relationship between the remaining drawing and that now lost: ‘same range seen from a/ higher point/ Aug 15th’. 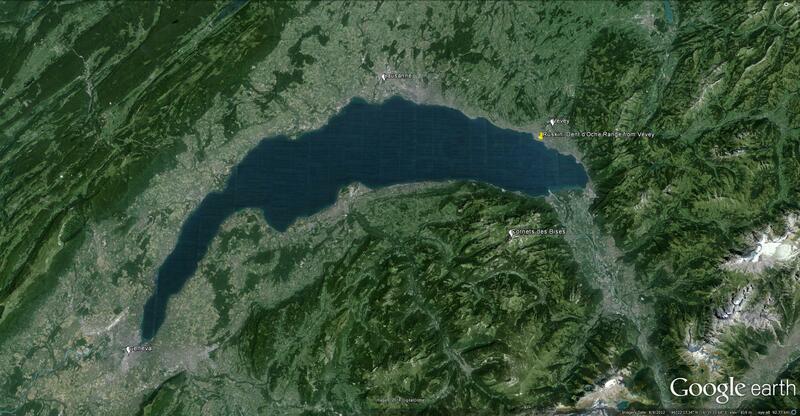 The implication is that the lost drawing of 13 August showed the same material as that remaining, but from a lower viewpoint, closer to Vevey. 7 Hill 2012, op cit. 8 See especially his account of working out the Matterhorn in Modern Painters, Volume IV, 1856, chapters XIV ‘Aiguilles’ and XVI ‘Precipices’. 9 Compare, e.g. the summary of Ruskin’s later sense of the superiority of drawing given by Michael Harvey in ‘Ruskin and Photography’, Oxford Art Journal, Vol.7, no.2, 1984, p.31 ff. That’s not a compliment I receive very often! This entry was posted on April 4, 2014 by Professor David Hill in Ruskin and tagged Alps, John Ruskin, King's College Cambridge, Lac Leman, Lake Geneva, Switzerland, Trois Couronnes, Vevey.